Tim Horton's??? Yes, don't laugh. I'm pretty sure most of you have been to Tim's already; but for comparison purposes, I decided to combine all my previous visits into one post on it. Besides, it has an almost iconic status in Canada. 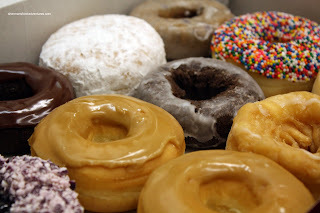 Who hasn't heard of a "Double Double", "Tim Bits" or something with maple glaze all over it? It's actually something that we can associate with Canadian culture. Well, it actually merged with Wendy's in 1995. So much for Canadiana. 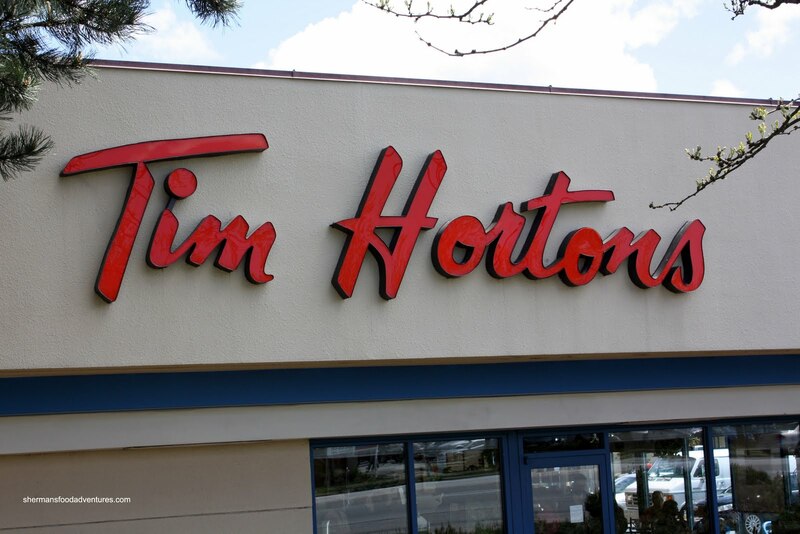 Fortunately, due to corporate tax legislation, Tim's became a Canadian company again in 2009. As mentioned, I've been to Tim's many, many times and finally decided to do a post about it. Let's call it my duty as a Canadian to represent. Now, representing is one thing; but to give an honest opinion is another. That's being Canadian isn't it??? Well, I'm gonna say it and I hope it doesn't anger too many people - I really don't prefer Tim's donuts. There I said it. I don't hate them; yet I don't find the texture that appealing. I much prefer donuts from Top Pot or locally, Harmony. 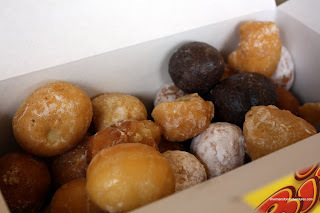 I find that Tim's donuts are a bit dense for my liking. However, I do not mind their Tim Bits. It's probably because they are smaller and bit e size. With that being said, I recently tried the Krispy Kreme donut holes and they're better. In terms of the food, I'm a bit indifferent. Their sandwiches are merely passable. The reason? I find their bread incredibly dense and tough to chew. Every time I take a bit into a Tim's sandwich, more filling slips out of the roll than into my mouth. It's a frustrating exercise. It's not the easiest sandwich to bite through. I'm not even sure if they are a good value to tell you the truth. Okay, sandwiches and donuts, I don't prefer; however, I really like their chili. Something about th e meatiness and the thickness of the chili appeals to me. Again, I'm not a huge fan of the bread that comes with it. Haven't they heard of yeast??? For breaky, I don't mind their breakfast sandwiches. However, the egg inside looks a bit scary. Neither nuked or scrambled, they are uniform in shape and strange in texture. Whatever, it doesn't taste too bad. The B.E.L.T is a solid Bagel, Egg, Lettuce and Tomato sandwich that I find better than McD's. A side of baked hashbrowns is not bad either. A bit small; but probably better that we eat less of them anyways after a buttery biscuit, sausage, egg and cheese! committing blasphemy; but hey, I like my coffee that way. Well, there you have it. I'm a bit indifferent towards Tim's. I hope that doesn't make me any less Canadian. Yet, I do play hockey, am indifferent towards all political parties, peace-loving, say "Thank You" and "Please" and continually end my sentences in "eh". That must count for something eh? I think it's only fair if you compare sandwiches across the board with other big franchise companies. Eg. How would you rate Tim's sandwich and value with McD's, Subway, and Quizno. How would you rate Tim's coffee with McD's new Premium coffee? 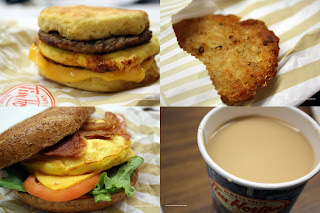 McD's breakfast sandwhich with BK's breakfast sandwich with Tim's? That's a good point Anson. I think that the sandwiches at Subway are a better value and I like the bread more. However, as much as I like Quizno's, I don't find them a very good value. I don't really like McD's sandwiches. McD's actually has pretty good coffee and it's cheap! I think Tim's coffee is a bit weak, but then again, I like it weak. I've always like McD's breaky sandwiches, never liked BK's (although they are big). I do like the Sunny Start at Triple O's tho. ahh, timmies. i agree, the food isn't that great. i've never liked the donuts and the cookies were better when they were (slightly) smaller and half price!! the steeped tea is very good if you like tea. i've been known to munch on a chocolate danish or two as well. i agree with the bread thing, it does cause the fillings to slide out when you bite into it. i do like mcd's coffee way better than timmies and at starbucks try the americano instead of drip if the bitterness is too much. so what's next, a post on subway? eh? Thanks for the tip Zud! LOL... I've been to Subway quite a few times lately and... haven't decided to post about that or not. Well, I have blogged about Timmy's a couple of times and I have no guilt for doing that. After all, not all of our readers are in Canada! (Not to mention, in my case, it was a post of Timmy's in the US). A lot of people fail to note one thing about Timmy's: It is consistent wherever you are. Now, that consistency might swing both ways but, when people wants something "familiar", it works fine. Kim, that's what I was thinking. Also, it's nice to blog about something that we may mention in other posts. Gives a point of reference. Did you happen to have the opportunity to try Timmy's French Onion Soup? You know what Anson, I haven't tried it yet and I want to. But... I don't really do all that well with onions. I'll need to try it on a day where I won't be doing anything else... LOL... TMI? I happen to like Timmie's fresh baked bread. I like the chewiness and it seems to taste great with their chicken filling. While I prefer my coffee stronger, a la McD's or even 7-11, I'm a sucker for Timmie's promotional items. Whenever I see an ad on the latest promo item of the month, I always get a craving to check it out. Unfortunately, they always run out of these items first!! Yup Holly, food is a very personal thing. If not good for someone, it's great to someone else. Yah, they do a good job in coming up with creative theme items. Commercials are pretty clever too (if not a bit corny...).